Flour is a common ingredient in most everyday foods. It is used in desserts and breads and noodles. Most often, we use white or wheat flour, which contains gluten that affects your digestion and has many other side effects. If you have Celiac disease or are gluten sensitive, here’s good news for you! Gluten-free flour is the rage right now. 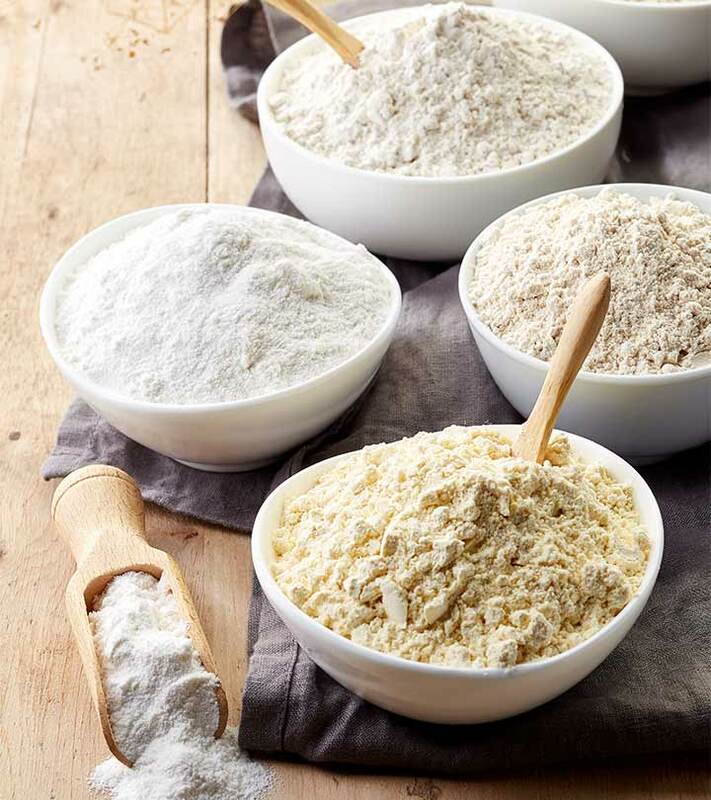 In this post, we will discuss the top gluten-free flours and how most of them can benefit you. Keep reading! Why Gluten-Free Flour? What Is It Made Of? What Are The Gluten-Free Flours You Can Look At? What Are The Possible Benefits Of Going Gluten-Free? If you are gluten intolerant, you might have a hard time eating most foods made of flour (as most of them tend to contain gluten). But with gluten-free flour, this need not be the case. Over 2.5 million Americans are known to have Celiac disease (1). For them, avoiding gluten is the only option to maintain good health. Many others face issues with gluten – and for them, going gluten-free is one way to ensure they don’t fall sick. This is where the importance of gluten-free flours comes into the picture. Gluten-free flours are typically made of nuts and seeds. Apart from not having gluten (which can be beneficial for some), they can also help you in other ways. What are these flours? Almond flour is made from ground and blanched (and with the skin removed) almonds. This flour has a nutty flavor – and one cup typically contains over 90 almonds. It is commonly used in baked foods as an alternative to wheat flour that contains gluten. Almond flour has some benefits too. Almonds have been found to lower bad cholesterol levels, which increase the risk of cardiovascular disease. 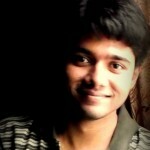 Intake of almonds may also elevate the levels of good cholesterol (2). But be wary of the calories as one cup of almond flour has 640 calories, which is 200 calories more than wheat flour. Amaranth was once a staple in the Maya and Aztec civilizations. It has an earthy and nutty flavor. When baking, it is important you combine this with other gluten-free flours. You can use it to make tortillas, bread, and pie crusts. Amaranth contains phytochemicals that offer excellent antioxidant benefits (3). It also contains quality protein and other unsaturated fatty acids (4). Teff is the world’s smallest grain, but it is quite nutritious. It is popularly used in cereals, pancakes, breads, and other snacks. The flour is rich in protein and helps curb cravings, which can help individuals wanting to lose weight. Teff also contains the most calcium than any other grain (5). It is also rich in dietary fiber, which boosts the digestive system. The grain also contains other important polyphenols and minerals – making it an ideal addition to gluten-free food preparations (6). Teff flour can also improve glucose metabolism, thereby helping people with diabetes (7). This flour has a rich, earthy flavor and works wonderfully well for baking quick breads. Though it has ‘wheat’ in its name, it is not a wheat grain and doesn’t contain gluten. 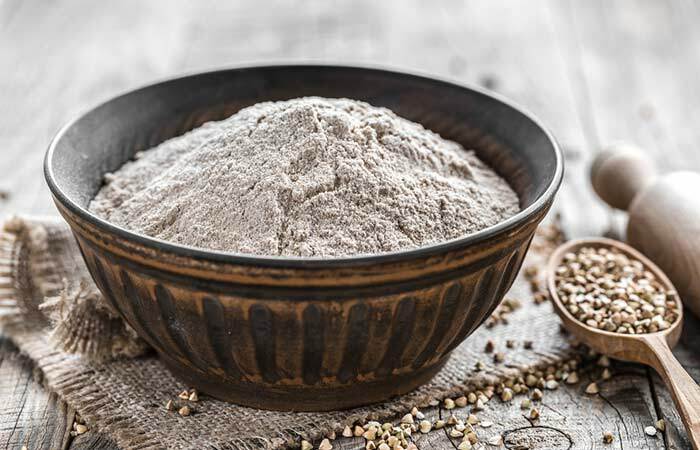 Buckwheat flour is particularly rich in rutin, a flavonoid that helps in the treatment of insulin-resistant diseases (8). The flour also possesses prebiotic and antioxidant properties. Its other benefits include cholesterol reduction, neuroprotection, and anticancer and anti-inflammatory effects (9). The rutin in buckwheat flour was also found to have potential beneficial effects in treating Alzheimer’s disease (10). Chickpea flour is also known as garbanzo flour, gram flour, or besan. The flour has a nutty taste and a grainy texture – and is an excellent source of fiber and plant-based protein. In combination with other pulses and cereals, this flour can have beneficial effects on cardiovascular disease, type 2 diabetes, and even some forms of cancer (11). This flour is made from the starchy liquid extracted from the cassava root. It is often added as a thickener in soups and sauces and pies and is also used in bread recipes. The resistant starch in the flour functions like fiber and boosts digestive health (12). Cassava flour is made by grating and drying the entire cassava root. It is most similar to white flour (though it doesn’t contain gluten) and can be used in recipes that need all-purpose flour. Similar to tapioca flour, this flour variety also contains resistant starch that promotes digestive health. As the name suggests, this flour is made from ground brown rice. This is a whole-grain flour as it contains the bran, the germ, and the endosperm. This flour is used to make noodles, breads, cakes, and cookies. Brown rice flour is far superior to refined flour as it contains essential amino acids, dietary fibers, vitamins, and minerals. Studies also show that this flour can help treat hypertension and diabetes and may even prevent cancer and cardiovascular disease (13). This is made from whole-grain oats. It contains a soluble fiber called beta-glucan, which has several health benefits. Studies show how this fiber can reduce bad cholesterol levels (14). Oat flour also contains nutrients like protein, B-vitamins, phosphorus, and other essential antioxidants. 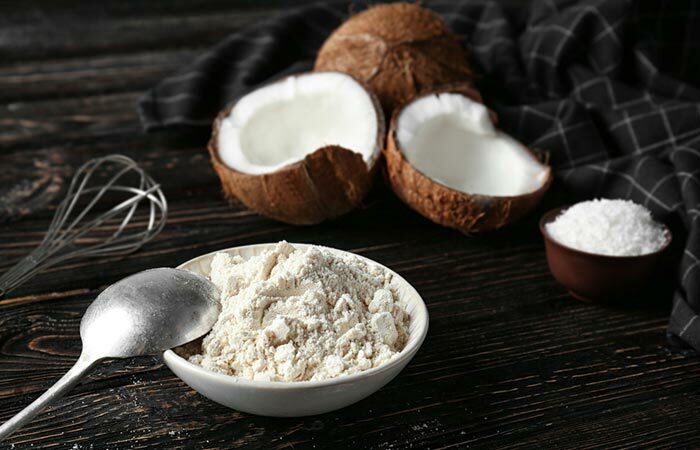 Coconut flour is made from dried coconut meat. It can be used like regular flour to make desserts and breads. The flour is high in lauric acid, a medium-chain triglyceride that is known to lower bad cholesterol levels (15). Tigernut flour is made from small root vegetables (tigernuts). It has a nutty and sweet flavor. The flour can be used for preparing baked goods. Thanks to its sweet flavor, it may easily help you cut added sugar in your food preparations. Tigernut flour is a powerful source of essential antioxidants (16). The flour also contains several essential amino acids important for human consumption (17). This flour can be mixed with other flours (like that of coconut, almond, or tapioca) to make breads and desserts. Arrowroot flour is made from a starchy substance extracted from a tropical plant named Maranta arundinacea. It contains potassium, phosphorus, magnesium, iron, and calcium (18). Arrowroot was also found to have immunostimulatory effects (19). Sorghum flour has a light color and texture and a mildly sweet flavor. It is a dense flour – and is often used in recipes requiring just a small amount of flour. Studies show that sorghum can reduce glucose responses – making it an ideal ingredient for managing glucose levels in healthy individuals (20). Sorghum flour also contains phytochemicals that can promote cardiovascular health (21). Corn flour is commonly used as a thickener for liquids. It can also be used to make tortillas and breads. It can also be combined with other gluten-free flours to make pizza crust at home. The flour is a rich source of lutein and zeaxanthin, antioxidants that boost eye health (22). Corn flour is also rich in other nutrients like thiamine, vitamin B6, magnesium, and selenium. Being on a gluten-free diet has never been easier! You can go ahead and make your favorite dishes with any of the flours mentioned above. They will not cause issues – unlike other flours that contain gluten. More importantly, these flours also offer other health benefits. Talking about that, is going gluten-free worth it? Does it have any benefits? Individuals with gluten sensitivity or Celiac disease can benefit the most from a gluten-free diet. It can prevent the symptoms of irritable bowel syndrome. A gluten-free diet may also improve certain symptoms of autism. Some sources suggest that a gluten-free diet can improve behavior and social skills in children with autism. However, we need more research before we can arrive at a conclusion. That said, gluten-free diets shouldn’t become a fad. Many people on gluten-free diets don’t have the actual need to be on these diets. The biggest risk they potentially have is that they miss on a healthy, well-balanced diet. This is because most gluten-free foods that you find on supermarket shelves are actually processed to remove gluten from them. These pose a bigger risk. Gluten can be bad for some people – but not for all. If gluten is bad for you, you may also want to avoid wheat flour, rye flour, and barley flour. These flours contain high amounts of gluten. 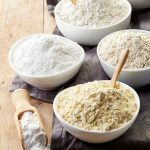 Gluten-free flours serve as a wonderful alternative for people with Celiac disease or gluten sensitivity. Make sure you look into the nutrients, flavor, and recipe before you choose a flour. However, if you have no issues with gluten, you don’t have to switch to gluten-free flours. Are you sensitive to gluten? Have you tried any of these gluten-free flours? Do let us know by leaving a comment in the box below. Can you store gluten-free flour in the freezer? Yes, you can store most gluten-free flours in the freezer for up to a year. All nut flours, like that of almonds or coconut, must be refrigerated or frozen. “What is Celiac Disease?” Celiac Disease Foundation. “Almonds and cardiovascular health…” Nutrients, US National Library of Medicine. “Phytochemicals in quinoa and amaranth grains…” Molecular Nutrition & Food Research, US National Library of Medicine. “The revival of amaranth as a third-millennium food” Neuro Endocrinology Letters, US National Library of Medicine. “Teff as a raw material for malting…” Journal of Food Science and Technology, US National Library of Medicine. “Chemical composition and food uses of…” Food Chemistry, US National Library of Medicine. “Improved glucose metabolism by…” PloS One, US National Library of Medicine. “Application of near-infrared reflectance…” Journal of Agricultural and Food Chemistry, US National Library of Medicine. “Buckwheat as a functional food and its effects…” Journal of Agricultural and Food Chemistry, US National Library of Medicine. “Buckwheat phenolic metabolites in health…” Nutrition Research Reviews, US National Library of Medicine. “Nutritional quality and health benefits of…” The British Journal of Nutrition, US National Library of Medicine. “Health properties of resistant starch” Wiley Online Library. “Germinated brown rice and its role in…” Critical Reviews in Food Science and Nutrition, US National Library of Medicine. “Cholesterol-lowering effects of oat…” The American Journal of Clinical Nutrition, US National Library of Medicine. “Coconut fats” The Ceylon Medical Journal, US National Library of Medicine. “Processing effects on the antioxidant…” Preventive Nutrition and Food Science, US National Library of Medicine. “Tiger nut: as a plant, its derivatives and benefits” African Journal of Food, Agriculture, Nutrition and Development. “Chemical composition, mineral profile, and functional…” Plant Foods for Human Nutrition, US National Library of Medicine. “Evaluation of immunostimulatory effect of…” Cytotechnology, US National Library of Medicine. “Grain sorghum muffin reduces…” Food & Function, US National Library of Medicine. “Sorghum phytochemicals and their…” ScienceDirect. “Dietary sources of lutein and zeaxanthin…” Nutrients, US National Library of Medicine.